The space shuttle Discovery and its STS-133 crew will deliver the Permanent Multipurpose Module, packed with supplies and critical spare parts, as well as Robonaut 2, the dexterous humanoid astronaut helper, to the International Space Station. The launch attempt on Wed., Nov. 3 was delayed, however. This storywas updated at 7:45 p.m. EDT. CAPE CANAVERAL, Fla. ? The space shuttle Discovery's finallaunch has been delayed at least 24 hours due to an electrical glitch with oneof the orbiter's backup engine controllers. Shuttle mission managers decided late today (Nov. 2) todelay Discovery's planned Wednesday launch to allow extra time for engineers toaddress the engine controller malfunction. The next attempt to launchthe space shuttle will come no earlier than Thursday, Nov. 4, at 3:29 p.m.(1929 GMT), they said. During checkouts of the orbiter today, the backup controllerfor Discovery's Main Engine No. 3 did not turn on as expected, said Mike Moses,NASA's shuttle integration manager, in a news briefing. The controllereventually powered on, but voltage irregularities were subsequently observed, saidhe added. "The signature coming out of that circuit showedanother little glitch that was a little bit unexpected ? something we hadn'tseen before," Moses explained. "They were two separate events at twoseparate times in the day, but we think the cause of that is a commoncause." Shuttle technicians will continue to analyze the availabledata overnight, and the decision to proceed with Thursday's launch will dependon whether mission managers feel they adequately understand the problem and itscause. They are expected to meet again tomorrow at 2 p.m. EDT (1800 GMT) toassess the situation. "We fly with known risks, not unknown risks,"Moses said. "Right now this risk is a little bit unknown." Discovery is slated to liftoff from its seaside pad here atNASA's Kennedy Space Center to deliver a room of spare supplies and anew robot to the International Space Station. The shuttle's launch hasalready been delayed by two days as a result of other technical issues thathave since been resolved. 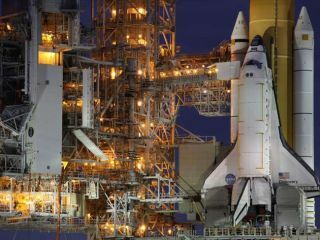 Discoverywas originally scheduled to launch Nov. 1, but the space agency delayed by oneday after detecting helium and nitrogen leaks on the shuttle. That launchtarget slipped a day, too, because the repairs took longerthan expected. "Discoveryisn't going out easy," said Mike Leinbach, NASA's shuttle launch director. "She's giving us a little bit of trouble, but that's fine. She'll flyperfectly when she does." Withthe new Thursday launch date, however, Mother Nature could further complicatethe situation. A weather front is pushing down into parts of central Floridathat could ground the orbiter for longer, according to Kathy Winters, NASA'sshuttle weather officer. Currentforecasts give Discovery dismal odds for good weather at launch time onThursday. Thereis a 70 percent chance that foul weather will cause yet another launch delayfor the space shuttle, Winters said. The main concerns are low clouds andshowers at the launch site, she added. NASAhas until Sunday, Nov. 7 to launch Discovery within the current window. Afterthat, the space agency will have to wait until Dec. 1 to try again. Follow SPACE.com Staff Writer Denise Chow onTwitter @denisechow asshe covers Discovery's final space voyage from Cape Canaveral, Fla. Click here formission updates, new stories and a link to NASA's live webcast coverage.